[prMac.com] Taipei, Taiwan - Packing Pro, the popular travel app for the iPhone, iPad & iPod touch by QuinnScape, today is proud to announce the release of version 11.0. This major update adds support for Dropbox, Box, AirDrop & iCloud Drive, allowing users to share their packing lists across the room or around the world. New list enhancements include the options of displaying item images directly on the list, as well as setting individual items' prioritiy and need to buy flag. List totals now show both the broken-down value & weight subtotals for each person, bag & category (for the entire list), as well as the currently packed sub-subtotals for each of these break-downs. This is a great help for weight-conscious backpackers and those wishing to avoid excess baggage fees. During the six years that Packing Pro has been on the App Store, it has been highlighted several times, including the current "Travel Survival Kit" and "Overseas Travel" promotions. It has also ranked at #1 for iPads and #2 for iPhones in the U.S. App Store's Travel section. Besides Apple, Packing Pro has also been recognized by CNN, WSJ, BBC, The New York Times, Expedia and Budget Travel, and has earned glowing reviews on major tech and app blogs (Gizmodo, Mashable, Macworld, CNET, TUAW and iPhone Life, among others). 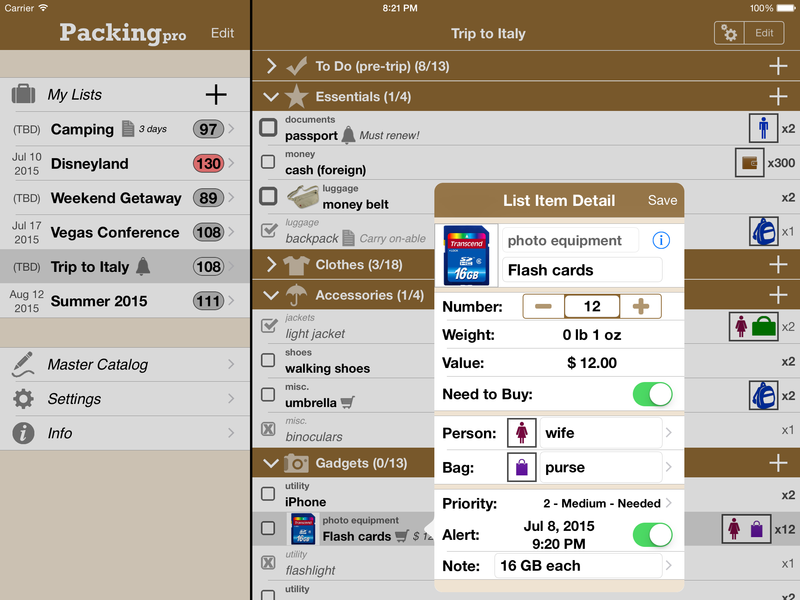 With update 11.0, Packing Pro now makes it even easier to share lists with other family members & fellow travelers. New list options let users create richer & more useful content, and enhancements to the Totals function allow one to monitor & manage ones baggage weights while packing. See for yourself how all of this has greatly improved the overall user experience. Since its founding in October 2008, QuinnScape has been managed by Quinn Genzel. Quinn is best known for his popular, top-ranking travel packing apps: Packing (+TO DO!) and Packing Pro. Packing Pro has been recognized by Apple, CNN, WSJ, BBC, National Geographic, Budget Travel, Fodor's, CNET, Macworld and a host of others as one of their top apps for traveling. Other app created by Quinn include a grocery shopping list app (Shopping Pro), nature appreciation apps (iLove Nature and iLove Birds), 3D VR action games (R.I.P and Ghost Buddy) and high-quality puzzles (the aQ's Pro Slider Puzzle series). Copyright (C) 2008-2015 QuinnScape. All Rights Reserved. Apple, the Apple logo, iPhone, iPod and iPad are registered trademarks of Apple Inc. in the U.S. and/or other countries.